On the 28th to 29th of January, our team was invited to attend the Boxenstopp@Daimler event in Vaihingen, Stuttgart. 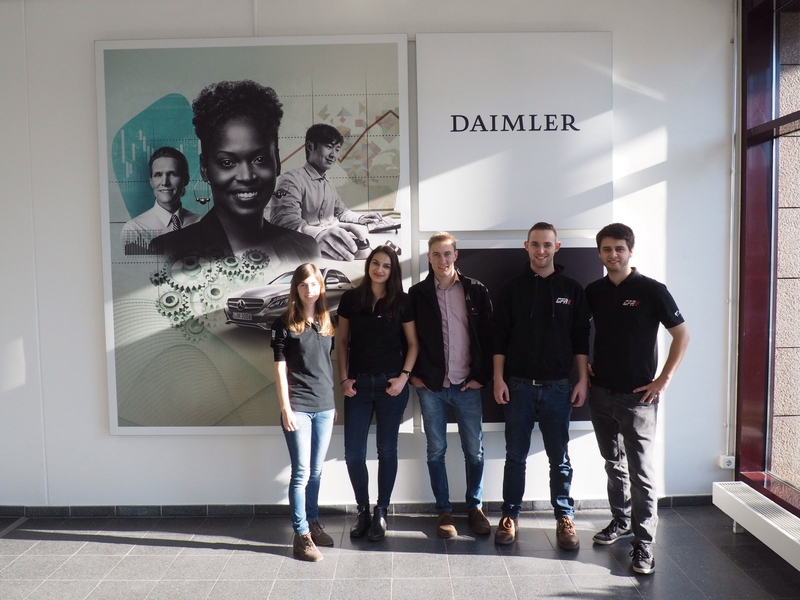 Every year, Daimler hosts this event for their annual Daimler sponsorship winners in order to meet the other teams and provide interesting training lessons. The program gave us the chance to expand our knowledge on project management applied onto our team. The coaching had a strong discussion based focus, allowing the attending teams to get to know each other. Both days were packed with workshops in the morning and afternoon. On Thursday evening Daimler took us to a carting track and all of us had a lot of fun in a tough 60-minute endurance race. After the winning ceremony we had dinner right beside the track allowing us to have a relaxed talk with our Daimler mentors. The insight of the driving simulator at the Mercedes Benz plant in Sindelfingen made a delightful ending of those intense 48 hours. At this point we would like to thank Daimler for organizing the event. We appreciate participating and are looking forward to the further cooperation. We would also like to thank CAT Racing Coburg, Elefant Racing Bayreuth, Hawks Racing Hamburg and Racetech Freiberg, with whom we enjoyed sharing this experience during those intense two days!